The Department of Homeland Security’s E-Verify system is supposed to tell employers if an applicant is authorized to work in the United States. An independent study shows the system has more misses than hits when it comes to fake IDs. This is what could happen when E-Verify doesn't work. The Department of Homeland Security commissioned Westat to do the study to determine where the holes are in the system. According to Westat: the program often couldn’t confirm whether information workers were presenting was their own. Westat estimates that, primarily due to identity fraud, approximately half (54 percent with a plausible range of 37 to 64 percent) of unauthorized workers run through E-Verify receive an inaccurate finding of being work authorized. This means the system didn’t correctly assess the ID info of illegal workers 54% of the time. In the Precision Machined Products Industry, our customers demand, and we deliver 100% On Time and Zero PPM Defects. Homeland Security’s critical E-Verify program gets a pass on a 54% error rate? I guess it works great, unless someone gives them false data. What you can expect: Audits of I-9 forms at employers. How do we know? This entry was posted on Wednesday, March 24th, 2010 at 5:34 am and is filed under Front Office. You can follow any responses to this entry through the RSS 2.0 feed. You can leave a response, or trackback from your own site. No amnesty, No Comprehensive Immigration Reform (CIR). They keep repeating the–SAME TIRED NUMBER–but the US border Patrol in just the Tuscon sector, expressed, \”Only one out of ten is caught.\” The Tucson sector Border Patrol union local 2544 on the number of illegal aliens in our nation: \”There are currently 15 to 20 million illegal aliens in this country by many estimates, but the real numbers could be much higher and the numbers increase every day because our borders are not secure (NO MATTER WHAT THE POLITICIANS TELL YOU-DON\’T BELIEVE THEM FOR ONE SECOND) Said a Spokesman for the Border Patrol. \”Our illegal immigration numbers are based on an estimated twenty million illegal aliens having been present in our nation as of -JANUARY 1, 2004.\”almost four million people crossed our borders illegally 2002\” end of quote. Other experts on the subject agree that illegal crossings have only increased since then. Please don\’t believe my numbers? Go to the US Census Bureau and read we could have a population of 438 million people by 2040, unless we halt this travesty for good? Americans cannot afford 10 million more families. Foreign nationals are very knowledgeable at cheating the IRS and the US taxpayer. They can even get child credits for their children, either not in America or in some other country. Once those here receive appropriate green cards they can then sponsor immediate family member, including people with infirmities as long as they are financial sponsored. But this is a joke, because once here the law–IS NOT ENFORCED. They then become public charges. They can collect Supplementary Security income (SSI) and other benefits. The number can never be truly calculated? Even the US Census will be off the mark, because hundreds of thousands, perhaps millions will stay silent. Now the number of illegal immigrants who have no intention of renewing their entry visa, or have slipped past the Border Patrol (Canada and Mexico, South American countries and islands) must be deported. We need professional and highly skilled workers, but not desperate uneducated, non-or semi-skilled. We have millions of Americans and legal residents in that category. Guest workers for farms and agriculture, but they must stay in that job until their visa expires. No options!.Then go home? California the SANCTUARY STATE, ARIZONA & NEW YORK have been bled dry. Black-Americans are especially vulnerable to the illegal alien invasion. as millions of jobless have extracted from employment to rehire minimum wage foreign national applicants. Americans with rights have been terminated for the same reasons, that parasite businesses can exploit the undocumented with reporting them to ICE, stealing their wages, confined in hazardous conditions or other severe situations. Whereas Citizens and residents have the option of reporting the employer to the labor department. The true estimate of foreign nationals in America is somewhere between 20 and 30 million? If AMNESTY is forced through the numbers will skyrocket, as countless numbers will be ready to bridge the border, just before President Obama signs the new reform. (with the wife and kids this would amount to 40-50 million people) on welfare, in subsidized housing, food stamps, WIC, more teachers, covered by Medicaid and other payments. They will not be paying any taxes because of the EIC and Child Tax credits will reimburse them. The IRS does not follow up on this type of fraud? This is a cruel trick on every honest taxpayer is this first generation of newly legalized immigrants, could escalate with thousands bring in brothers, sisters, Mothers and Fathers. By the year 2040 the population of America could be unsustainable with limited resources, water shortages, highways crammed to capacity and a infrastructure that is falling apart. THOSE INTERESTED-THE HISTORY CHANNEL IS ONCE AGAIN TELEVISING \”The Crumbling of America.\” This Friday observe the depreciating bridges, dams, levees and 50 year old underground system of sewage in some areas. Our Survival is in peril, but they do not enforce immigration laws. In fact Homeland Security Secretary Janet Napolitano has cut the budget for the Border Patrol and other enforcement tools in the SAVE ACT and REAL ID Act. E-Verify has already under pressure to be dissolved, as it cuts into business profits by using discount labor. 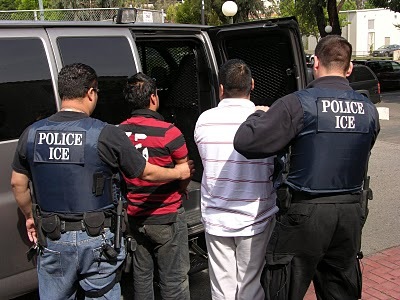 287 (G) is a very successful local police detainment for illegal aliens as with ICE audits, but even that has been compromised.Yet the Congress keeps appropriating money to fight foreign wars or aid other countries. There is much more to learn-not- the propaganda given to us by the business world Learn so much more by surfing the Internet or go to NUMBERSUSA. Read about the corruption from both political parties at JUDICIAL WATCH. Don\’t hesitate in calling your Senator or Representative at 202-224-3121 In addition Don\’t forget to give your State assembly a piece of your mind. Not copyrighted. TELL THE PEOPLE YOU KNOW–NO AMNESTY! It will entice Millions more to come for free government entitlements.